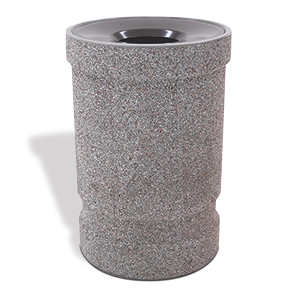 These large capacity 41 gallon concrete waste receptacles provide the heavyweight performance to help maximize neat public spaces and waste management programs. Preferred for the natural material look ASTM compliant concrete has the well-earned reputation of performance durability. The precision crafted aluminum lid allows for hands-free disposal while concealing and containing the contents. Comes standard with polyethylene liner and security cable. Suit any design theme with the available standard and premium finishes.